The rise of Trumpism has challenged every single aspect of being for progressives and our organizations. It is, as many of us have been saying, an existential threat to everything we care about: economic justice, racial and gender equality, a livable planet and global peace. The message and narrative challenges of the moment are critical and foreboding along at least two major fronts. We desperately need to develop a broader, more inclusive narrative that mobilizes our base and persuades many more winnable people in the middle. More Americans need to see themselves in a story that leads with progressive values and sets the stage for bold policy change. We know this story must be built in an organic way around real lived experiences that embraces all of our many identities, especially those deliberately denied respect and freedom to thrive. We must expose Trumpism and the conservative doctrine of by and for the wealthy. A narrative populism built exclusively on resentment and anger that scapegoats the most vulnerable people in America puts everything we are and believe at risk. Theirs is an attack on people of color through the structural violence of vile policies of detention, racial profiling and deportation, while at the same time erecting ever higher barriers to well-being for all but the wealthiest and most well-connected. In response to these twin challenges, I am proud that the Center for Community Change has partnered with Anat Shenker-Osorio, America’s most provocative and paradigm-challenging messaging expert. Her groundbreaking work brings immediate assistance to grassroots groups that are on the front lines of building immediate resistance, opposition and power for the comeback of a progressive vision for America. 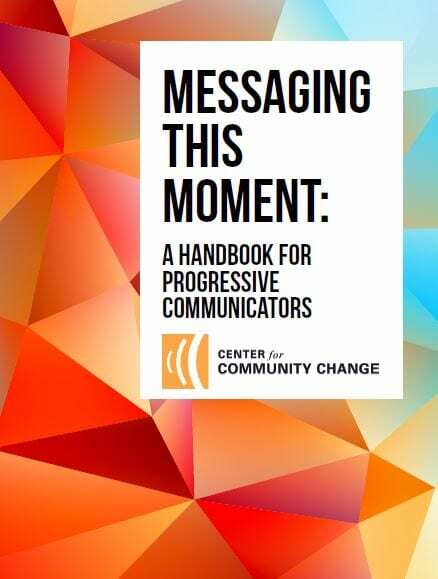 Besides this handbook, we’ve been able to reach hundreds of grassroots organizers through our Messaging This Moment convenings, webinars, message memos and ongoing coaching sessions with key leaders. We hope you find these materials inspiring and helpful, and we look forward to partnering with each and every one of you as we work together to bend the arc of history back toward justice.